The principle of membrane-supported guided bone regeneration (GBR) is currently the most commonly used technique for bone regeneration in the dental practice (BOSSHARDT & SCHENK, 2010). The biological mechanism underlying membrane-supported guided bone regeneration is the insertion of a barrier membrane that serves to clearly separate hard and soft tissues (e.g. see BOSSHARDT & SCHENK, 2010; ROTHAMEL et al., 2005; HÄMMERLE &amp;amp; LANG, 2001; HÄMMERLE & KARRING, 1998; KARRING et al., 1993; DAHLIN et al., 1988; GOTTLOW et al., 1986). The separation of the rapidly proliferating soft tissue from the more slowly regenerating hard tissue creates a protected compartment into which cells migrate from the bone defect region and where new bone tissue can regenerate (TAL et al., 2012). As a rule, a bone defect is filled with bone substitute and a barrier membrane is applied to cover the bone substitute, which provides the necessary volume, while ensuring the membrane makes direct contact with the adjacent bone surface (BORNSTEIN et al., 2010) because immobilisation on the bone appears to directly influence the ossification (DIMITRIOU et al., 2012; AMANO et al., 2004). 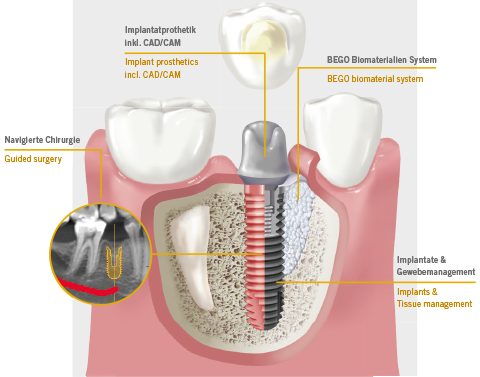 As a system provider in the implant dentistry sector, BEGO Implant Systems establishes surgical concepts and systematically assembled biomaterial product programs for therapeutic procedures in guided bone and tissue regeneration in addition to implants and a diverse range of prosthetic restoration options. In the protected cavity beneath the barrier membrane, a stable blood clot can form that acts as the initial matrix for regeneration. In addition to cell occlusiveness, the requirements for the ideal membrane for GBR techniques include good tissue compatibility, easy application and tissue integration properties. It is an essential requirement that the ideal membrane remains intact until the desired bone regeneration phase is complete and is only then integrated into the surrounding soft tissue (e.g. see GHANAATI, 2012; BORNSTEIN et al., 2010; SCHWARZ et al., 2008; McALLISTER & HAGHIGHAT, 2007; HARDWICK et al., 1994; GOTTLOW, 1993). Commercially available barrier membranes can be clearly differentiated from one another on the basis of several properties. The membranes can, for example, be divided into non-resorbable and resorbable membranes. Resorbability describes the property of the membrane to be biodegraded by physiological processes in the body of the recipient. Non-resorbable membranes are bio-inert. A surgical procedure is required to remove the membrane once the regeneration is complete. Along with the stress for the patient of a second surgical procedure, during the removal of non-resorbable membranes the underlying regenerated tissue can be damaged and there is a risk of subsequent crestal resorption of the alveolar bone (PIHLSTROM et al., 1983). Non-resorbable membranes do offer the advantage of a temporally unlimited barrier function and the associated exclusion of the soft tissue from the area of the bone regeneration. In contrast, resorbable membranes can be broken down in the body of the recipient by physiological processes. A procedure to remove the membrane is therefore unnecessary. Unlike non-resorbable membranes, resorbable membranes can only provide a limited barrier function to exclude soft tissue from the area of bone regeneration because the structural integrity of the membranes is disrupted as the resorption progresses (e.g. see SCHWARZ et al., 2008). Resorbable membranes derived from xenogeneic collagen for use in GBR procedures are very common these days. Collagens are a protein superfamily containing more than 20 different types. For barrier membranes, the fibrillar, structural collagens (types I and III collagen) from connective tissue structures are the most widely used (SCHLEE et al., 2012; SCHWARZ et al., 2008; SCHWARZ et al., 2006a & 2006b; ROTHAMEL et al., 2005; BUNYARATAVEJ & WANG, 2001). The BEGO Collagen Membrane is a resorbable barrier membrane derived from collagen for use in guided bone and tissue regeneration. BEGO Collagen Membranes are prepared from porcine pericardium in which the fibrous pericardium layer is made up primarily of dense collagen fibrils. The properties of the pericardium are optimally adjusted to ensure the heart is protected from over-stretching.